10 Days! 9 Days! 8 Days! 7 Days! Christmas has conspired with our germ-filled house and stolen the last few days from me! Each day I’ve told myself I have to blog, and each day I just couldn’t quite get it together to sit down and do it. The truth is I’ve been really exhausted lately, and this cold has been the last straw. But I’m feeding it copious amounts of chocolate so I expect to make a full recovery in the next few days. Time is getting short – just a few short days till the official launch of Sorrowline. But Amazon have already jumped the gun and started dispatching copies at the end of last week. If you’ve already pre-ordered there is a good chance you’ve got your copy. And the Kindle version is now available to pre-order here. I’ve not heard of any sightings of copies in the wild yet, but if you spot it in a bookstore please let me know, or better yet, send me a picture. I went to London recently for the Andersen Press Christmas Party. It’s the second time I’ve been invited and it’s a great chance to meet up with the great team behind Sorrowline. My editors, Ruth Knowles, Eloise Wilson and Charlie Shepard were there, and I finally met Klaus Flugge, the eccentric genius behind Andersen Press. 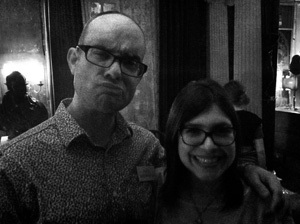 My agent, Juliet Mushens was also there, making sure I wasn’t being too silly. She failed. James Newbery (Age 10) Sorrowline is a fast, action-packed book, filled with time travel and adventure. Seth Age 13 I would recommend this book to anyone 10 years and over and I give it 9/10. Shea Devlin Age 13 This book was very hard to put down, it is a brilliant story and I would recommend it to all teenagers. Pearse Kelly Age:12 I recommend this book to any lovers of Percy Jackson or Doctor Who.